Tomorrow, our neighbours in Sutton will be able to mark the end of the holiday period by placing their used and unwanted dying old Christmas trees outside their homes for collection, free of charge, by the local council. 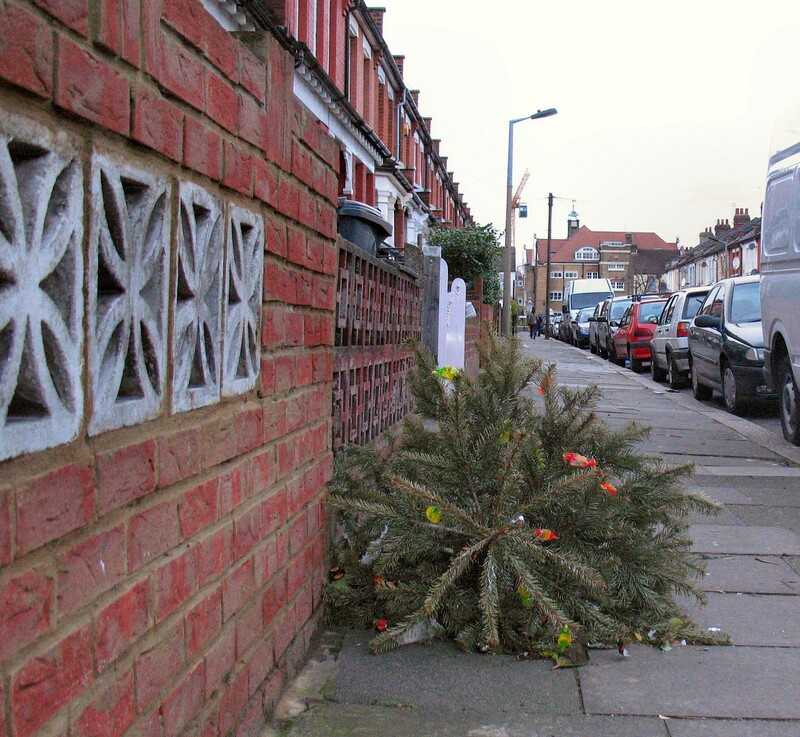 In Lambeth, where residents continue to enjoy the benefits of a weekly rubbish collection service, the council will also take away old trees (the official website helpfully noting for the hard of thinking that they should have decorations removed first) for chipping and re-cycling when their dustcarts make the scheduled tour of the borough’s streets during the week. In Croydon, there is no such Christmas tree collection service. It is just another example of Croydon Council’s penny wise, pound foolish approach to local services. There is a growing consensus that Croydon’s halving of regular bin collections has done nothing to enhance to state of the borough’s streets, prompting an increase in “casual” domestic tipping of bin bags on the pavements. Any savings made from reducing the bin collections is then used up in clearing the resulting mess. So it is with Croydon’s Christmas trees. Instead of a fleet of contractors trucks doing the job in an organised fashion, Croydon’s “plan” is for thousands of households to get in their cars (if they have one) and drive to a re-cycling centre. Hardly the most environmentally friendly way of handling this annual by-product of Christmas. Inevitably, there will be hundreds, maybe even thousands, of less conscientious residents who opt to dump their trees on our street corners or in our parks. Somebody else’s problem. Which ultimately, someone from the council’s street cleaning and fly tipping team will have to deal with. All at additional cost. To Council Tax-payers. Meanwhile, in boroughs next door to Conservative-run Croydon, in Sutton (which is under LibDem control) and Lambeth (Labour), there are weekly bin collections and trees removed for proper re-cycling. It can’t be that difficult. Post your comments on this article below. This entry was posted in 2014 council elections, Croydon Council, Environment, Fly tipping, Gardening, Lambeth Council, Refuse collection, Sutton Council and tagged Christmas, Conservative, Council Tax, Croydon, Croydon Council, Environment, Fly-tipping, London Borough of Croydon, Mike Fisher, re-cycling, rubbish. Bookmark the permalink. I’m sure someone from the council will explain where its share of his £250M has got to. The short sightedness of the Council surely provides an opportunity for environmental groups linked to re-cycling activities to run their own collection service. Pity the National Trust does not manage Seldson Wood that it owns but has the Council manage them – it could be the delivery and chipping destination. Alternatively the Trust could allow its Morden Hall facility to be the destination. This policy of fortnightly waste collection is a directive from the EU, and not dear old Ed’s brother David (now sulking in American after failing in his ambitions to lead the party) who originally took credit for it. It is another example of the EU dictating our suburban lives, and there are many more. Councils like Lambeth should be commended for their commonsense, but there will be financial penalties… that’s a dead cert! Which EU directive is that? In fact, as a previous commenter noted, the local government secretary, Eric Pickles, is providing financial incentives for councils to provide weekly bin collections, cash which our Tory-run council has so far ignored. I am not an MEP but it is well publicised that there have many Directives from Brussels as to how we are obliged to dispose of waste. Directive 2008/92/EC of 19th November 2008 is just one. There are EU cash incentives available for Local Governments to adhere to these policies that I am sure are far great than anything Mr Pickles could muster. I can only remember Mr Pickles as an idiot MP who was exposed for claiming tax payers money by claiming expenses on a second home for which he was not entitled to. So don’t trust him! 2008/92 is about transparency of energy prices. I expect you mean 2008/98/EU, which (yawn) UKIP have an odd fascination with. Please can you tell us where it requires LAs to collect waste fortnightly.